It seems unreal right now, but my husband is on an airplane on his way to Iraq for the 2nd time in 14 months. "Goodbyes" are never easy, but at least we know that the countdown to this deployment being OVER has finally started. Spending only 10 out of the past 30 months together isn't the way I pictured my life when I married Ryan 3 and a half years ago, but I can honestly say that it has done nothing but make us stronger as individuals and as a couple. I had no idea how much I could learn about myself in that short of a time. 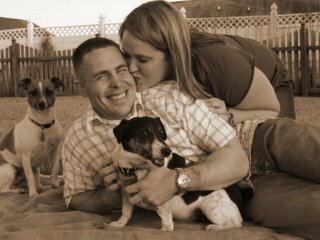 Life as a military wife is trying and tough to say the least, but there is nothing more rewarding than knowing my husband is a true American hero. I wouldn't trade this time in my life for anything. Ryan...we love you, support you, and are praying your way home. You are our hero!